The morning may have started with rain, but the sun came shining through and stayed with us for the remainder of the day. Thank you to everyone whose tremendous support helped us to break records once again. This year’s 20th anniversary event raised over $570,000 for the world-leading work at the Vancouver Prostate Centre. Our sincere thanks to all the sponsors, donors, volunteers, golfers and committee members who helped to make this event such a tremendous success. A final thank you to Rod Senft and his family for sharing their inspirational story with all of us. VGH & UBC Hospital Foundation partners with donors to provide the funds essential to ensuring that our hospitals and health care teams can deliver BC’s best, most specialized care for adults. We work hard to ensure excellent care is here when you need it – and one of the ways we do this is through events like the annual Mr. Lube Tournament for Life. 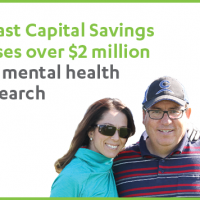 For the past 20 years, the Foundation has been honoured to produce this first-class charity golf event – raising over $2.9 million to advance prostate cancer research and care. The premier tournament at guarantees to deliver a day of exceptional hospitality, gourmet food, an exciting live auction, and of course, outstanding golf. Prostate cancer threatens the longevity of all the men in our lives. It’s the most common male cancer in Canada and the third leading cause of death from cancer in men. In BC, doctors diagnose about 3,600 new cases each year. Canada-wide, the number is closer to 24,000. The good news is that the mortality rate is declining – compared to 25 years ago, deaths from prostate cancer have dropped by 30 percent.However, there is still much work that needs to be done to learn more about the disease and find more effective and less invasive treatments. Here in Vancouver, we are fortunate to have a world-class facility dedicated to both advancing research and finding the best treatments for cancer patients. The Vancouver Prostate Centre at VGH is one of the top three prostate centres in the world. It’s also the largest program of its kind in Canada and is a model for similar institutions because of its unique and valuable linkages between research and treatment programs. Need more info? Email us or call 604 875 4676.